In honour of Orange Shirt Day on September 30, Xwi7xwa Library is highlighting materials in our collection with related themes: the residential school experience, healing journeys of the survivors and their families, and the ongoing process of reconciliation. Our materials on these topics include a range of formats (books, DVDs, government reports, graphic novels, and more), created for diverse audiences, including children, teachers, and scholars, Indigenous community members and non-Indigenous allies. 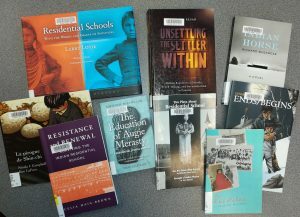 To find these materials at Xwi7xwa, search “Residential schools” on our online catalogue and filter by Location: Xwi7xwa Library, or try searching for subject headings starting with First Nations–Residential schools. Our research guide on the Indian Residential School System in Canada is another excellent resource. As always, you’re welcome to come by Xwi7xwa to browse our shelves, check out our display, or ask us for help!